View More In Sleeping Bag Accessories. 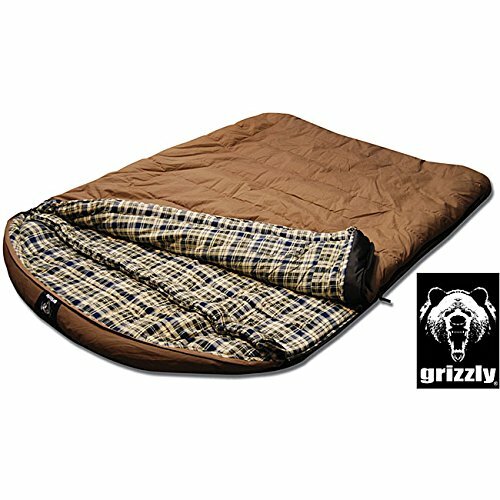 Stay warm while camping in colder temperatures with this Grizzly two-person +25-degree Rip-Stop sleeping bag. Easily take the bag with you using the included custom duffel, which features compression straps to make the bag smaller for easy packing. Enjoy a comfortable night's sleep due to the flannel lining, which is soft against the skin. The Hyperloft insulation keeps body heat inside the bag for warmth, and the built-in chest baffles keep the wind at bay. Get out of the sleeping blanket easily without waking up your partner using the zippers, which are located on both sides. If you have any questions about this product by Grizzly, contact us by completing and submitting the form below. If you are looking for a specif part number, please include it with your message.